Order your Write Notepads Fahrney's Exclusive Small 3.5 x 5.5 Notebook today from FahrneysPens.com. Fine Pens, Refills & Luxurious Gifts – great prices & fast shipping. 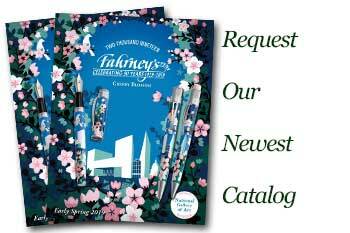 Fahrney's is proud to have partnered with Write Notepads & Co. in sponsoring a local Washington, DC public school and producing an exclusive Fahrney's 85th Anniversary Notebook. Each spiral-bound notebook has a finely letter-pressed rugged board cover and 120 perforated pages of fountain pen friendly premium brass-ruled paper with a durable closure band. The covers are printed with a drawing of Fahrney's retail store-front in Washington, DC and our motto "Keep the Ink Flowing". Choose from two sizes and right or left-handed design (spiral on the right). Pens, pencils and notebooks – these are the tools we often take for granted, though for many students, such tools are scarce. At Write Notepads & Co. they're empowering students who need these the most. When you buy a Write product, they'll not only donate free composition-style notebooks to a sponsored school, they'll also show you the exact school that is benefiting from your purchase. A donation code is printed inside each and every Write notebook that, when entered onto their website, shows you the sponsored elementary or high school. The hopes, dreams and ambitions of students...now mapped out with pen and paper. You may visit writepads.com, click the tab for 'Giving' and enter code 66244 to see the school Fahrney's is sponsoring. 100% made and sourced in the USA.